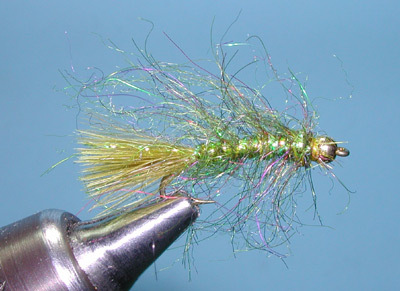 Notes: Randall Kaufmann's Mini-Leech was introduced in early 1990's and closely resembles the Mohair Leech. 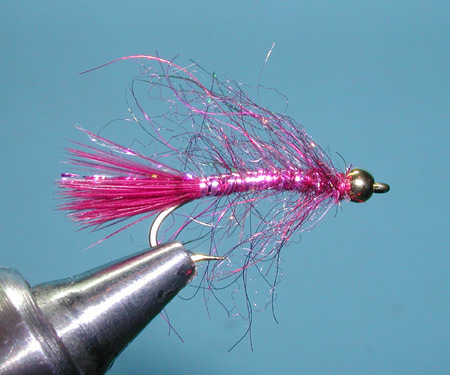 The main difference is that Randall uses the TMC 200R hook that has a curve to the main shank to tie them in smaller sizes from 10-14 in conjunction to the dubbing blend that allows a very slender body with long fibers. Randall makes a dubbing blend that is 1/4 SLF, 1/4 Rabbit, and 1/2 Angora Goat. Due to the smaller fibers within the blend, he uses a dubbing loop technique to lock the fibers in, utilizing dubbing wax so that the fibers adhere to the thread. He keeps the body dubbing very thin. The dubbing loop technique will allow longer fiber extensions from a thinner body. The dubbing loop is roped with 4-6 strands of Krystalflash that provides a ribbing to the pattern. 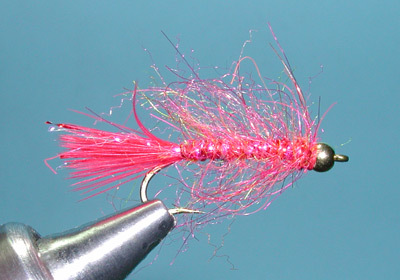 The tail is about 1/2 the shank length with four strands of flash over the top of the tail. Since many leeches are only abour an inch long, this pattern closely resembles the actual leech within our Sierran waters. 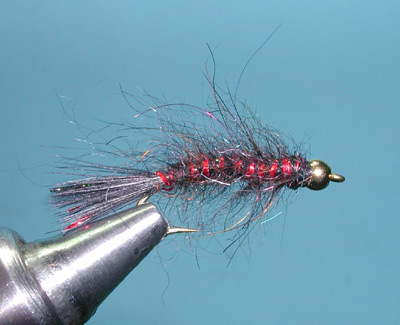 The pattern is often tied in red, wine, purple, black, brown, and dark olive.